If you don’t possess a cocktail shaker, use a large jam jar for the shaking and a tea strainer for the pouring (it may not be as chic but it does the job just as well). Pour the vermouth into a cocktail shaker, with half the ice. Shake around a bit and divide between two martini glasses. Swirl around the glasses to coat them and pour away. Now refill the shaker with the remaining ice and add the gin, lime juice and elderflower cordial. Shake around in a professional fashion and immediately strain into the vermouth-coated glasses. 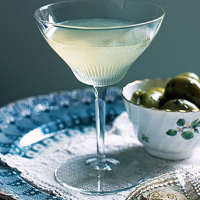 Serve with some green olives and be prepared to make and shake some more. This recipe was first published in April 2009.